The colors of Africa: What step of faith do you need to take? This week I had a dream that I was walking on a dirt path in Uganda, Africa. It was hot, but not unbearably so. I was wearing a sleeveless top, a blue jean skort, and light shoes like sandals or flip flops. I was walking alone, but not lonely, and was content. There was more to the dream, but this part of the dream encouraged me the most. I was actually in Africa! For several years I’ve been praying to go to Africa. It’s just something God has put into my heart, although I’m not really sure why. All I know is that God has spoken to my heart that I will go one day, and when I go, He has an impartation for me there. Things to teach me and to share with my heart, like He did when I went to Israel and to Niagara Falls, two other places I prayed for years to visit – and God made a way where there was no way. As He will do with me going to Africa. Things to inspire my writing in Africa. I have faith one day I will go, and am praying this is the year! 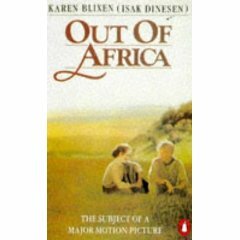 Out of Africa is one of my favorite books and movies. In the movie version, it stars one of my favorite actresses, Meryl Streep. Each time I view pictures of Africa, each time I see the movie, watching Karen (Meryl Streep) fly over the plains and seeing the wild animals running, my heart aches and longs to be there. The drums of Africa beat in my heart. Africa beckons me, and I don’t know why. I am re-reading the book again now. I’m preparing my heart through reading this book, through activating my faith, and through prayer. I also have to prepare for the journey by getting the yellow fever shot. The yellow fever shot is required to go to Uganda. I can’t go without it. I had my passport renewed when I went on the cruise to the Bahamas, so my passport is ready. Last year I bought a set of purple luggage on sale at Kohl’s on Black Friday, so I have new luggage to pack my clothes and other things (yes, I will pack light!). I have listened eagerly to their stories about living in Africa. God has been using them to teach me about preparing to go there. They are in close contact at their church with other missionaries to Africa, and I’m praying to see if these are possible contacts for me, too (a team that Ray and I could go with there). It’s not enough to just believe and have faith. Abraham had to offer up Isaac to prove his faith in God. If I want to go to Africa, I have to prepare, to take action steps of faith. What is it that you want to do for God? What first step of faith do you need to take right now to prepare? Share your first step in the comments below. Beth I cannot believe how we are so connected and seem to always be on the same page. Reading this I have chill bumps, Out of Africa is one of my favorite movies ever! I BELIEVE this is the year for African and I am praying God opens a door for us to go together.